The Space Exploration Technologies Corp., or SpaceX, Falcon 9 rocket with Dragon capsule attached on top is lifted into the vertical position during a rollout demonstration test at Space Launch Complex-40 at Cape Canaveral Air Force Station in Florida. This image was taken Oct. 2, 2012. SpaceX's robotic Dragon capsule is slated to blast off Sunday night (Oct. 7) on the first-ever bona fide private cargo run to the International Space Station. In May, Dragon become the first commercial spacecraft to visit the station. But that was a demonstration flight, while Sunday's launch kicks off the first of 12 unmanned supply missions SpaceX will make for NASA under a $1.6 billion contract. Dragon will deliver about 1,000 pounds (454 kilograms) of supplies, then return to Earth on Oct. 28 carrying more than 1,200 pounds (544 kg) of different gear down from the space station. Here's how the mission will work. 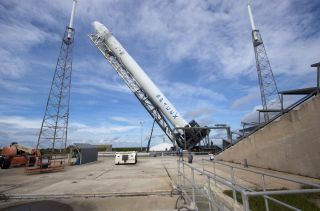 The Dragon capsule is set to blast off atop SpaceX's Falcon 9 rocket at 8:35 p.m. EDT Sunday (0035 GMT Monday). The mission has an instantaneous launch window, so if anything causes a delay Sunday, liftoff will be pushed to another day. The terminal countdown begins at T-minus 10 minutes and 30 seconds, at which point all launch systems will be autonomous. A final "go" for launch will come at T-minus 2 minutes and 30 seconds, NASA officials said. Seventy seconds after liftoff, the Falcon 9 rocket will reach supersonic speed. By 2.5 minutes into the flight, it will be traveling 10 times the speed of sound, at an altitude of 56 miles (90 kilometers). At about this time, the rocket's main engines will cut off. A few seconds later, the Falcon 9 rocket's first and second stages will separate, with the second stage soon performing a six-minute burn to take Dragon to low-Earth orbit. Nine minutes and 49 seconds after launch, Dragon will separate from the rocket's second stage. Seconds later, the capsule will reach its preliminary orbit, at which point it will deploy its solar arrays and begin a series of thruster firings to get it close to the space station. It will take Dragon several days to chase down the orbiting lab, and the spacecraft's final approach on Wednesday (Oct. 10) will be a cautious and controlled affair. During the approach, SpaceX and NASA personnel will perform one "go/no go" assessment that will potentially allow Dragon to get within 820 feet (250 meters) of the station. Once within that distance, the capsule will begin using its close-range guidance systems, which consist of thermal imagers and LIDAR (Light Detection and Ranging) remote sensing. Passing two more "go/no go" tests will permit Dragon to move within 98 feet (30 m) and 32 feet (10 m) of the station, respectively. It will hold at this latter distance — the capture point — for one final "go/no go." If all is well, space station astronauts Akihiko Hoshide of Japan and Sunita Williams of NASA will grapple Dragon with the orbiting lab's 58-foot (18 m) robotic arm. The pair will guide the capsule to the Earth-facing side of the station's Harmony module, where it will be bolted in place for its 18-day stay. On Thursday (Oct. 11), astronauts will open the hatches that connect Dragon to the station and begin offloading its 1,000 pounds (454 kg) of cargo. The supplies include such basics as food and clothing, as well as materials needed to support the 166 experiments planned for the station's current Expedition 33. Dragon will also deliver 23 student-designed microgravity experiments to the orbiting lab. Once this gear is transferred to the station, astronauts will load Dragon up for the flight home. The capsule will carry 734 pounds (333 kg) of scientific materials and 504 pounds (229 kg) of space station hardware, NASA officials said. On Oct. 28, NASA astronaut Kevin Ford will use the station's robotic arm to detach Dragon from the Harmony module and release the capsule about 50 feet (15 m) away. Dragon will perform three separate engine burns to start the journey home. Six hours after its departure, it will initiate its de-orbit burn, which could last up to 10 minutes. Dragon will then blaze through Earth's atmosphere for about 30 minutes, slowing its descent toward the end with a series of parachute deployments. The capsule will splash down in the Pacific Ocean about 250 miles (450 km) off the coast of southern California, where it will be recovered by SpaceX's crane-equipped boat. In a Google+ Hangout with SpaceX founder and CEO Elon Musk Friday (Oct. 5), NASA chief Charlie Bolden urged the public to follow Dragon's groundbreaking mission, beginning with Sunday's launch. "I would encourage any- and everyone who can get to a television or online or anything to help experience this," Bolden said. "It's absolutely incredible to see something leave the planet, no matter what it is, and hopefully everybody will take advantage of the opportunity to do that."